Size: * 2.5 lb. 10 lb. 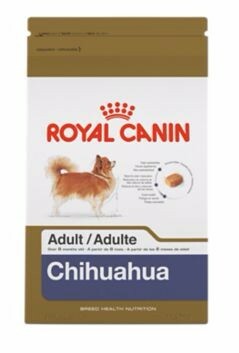 Chihuahua is designed exclusively for pure breed Chihuahuas over 8 months. Corn, chicken by-product meal, brewers rice, wheat gluten, oat groats, brown rice, chicken fat, natural flavors, dried plain beet pulp, fish oil, vegetable oil, calcium carbonate, potassium chloride, sodium silico aluminate, DL-methionine, fructooligosaccharides, sodium tripolyphosphate, salt, taurine, vitamins [DL-alpha tocopherol acetate (source of vitamin E), inositol, niacin supplement, L-ascorbyl-2-polyphosphate (source of vitamin C), D-calcium pantothenate, biotin, pyridoxine hydrochloride (vitamin B6), riboflavin supplement, thiamine mononitrate (vitamin B1), vitamin A acetate, folic acid, vitamin B12 supplement, vitamin D3 supplement], choline chloride, L-lysine, L-tyrosine, marigold extract (Tagetes erecta L.), L-carnitine, glucosamine hydrochloride, trace minerals [zinc proteinate, zinc oxide, ferrous sulfate, manganese proteinate, manganous oxide, copper sulfate, calcium iodate, sodium selenite, copper proteinate], tea, chondroitin sulfate, rosemary extract, preserved with mixed tocopherols and citric acid.